Comments The grace of divine energies starts with grace of the guru – he who is the giver of light dispelling the dark, he whose word has depth. 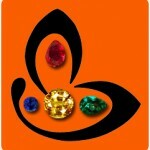 And what can be more magical than to experience the grace of the Guru with the gemstone of Jupiter itself. Featured today is a lovely natural and unheated Ceylon yellow sapphire of 2.84 carats set in 22 karat yellow gold as a Jupiter talisman ring. The enchanting cushion cut gem with luscious butter yellow color has excellent clarity and great lustre, giving the appearance of exquisite glittering gold speckles in the gem! Natural yellow sapphire or pukhraj/ kanak pushyaraag is the gemstone of planet Jupiter/ Brihaspati/ Guru and is the jyotish rashi ratna for zodiacal signs/ rashis of Sagittarius (Dhanu) and Pisces (Meen). A natural and unheated yellow sapphire is used in a talisman to harness the energies of this magnificent planet. 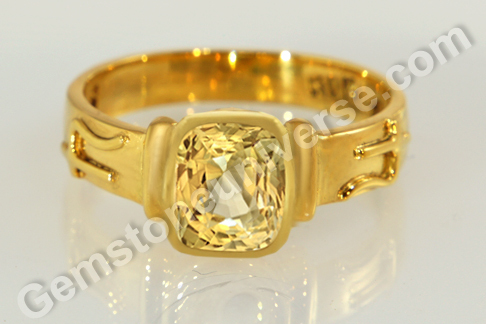 Natural yellow sapphire is a fantastic gem with hardness measuring 9 on Moh’s Scale. The healing power of yellow sapphire is well known aside of being known as a gem that brings wealth and good fortune. Yellow sapphire, just like its planetary energy bestows the power to live life expansively, experiencing life to the fullest. The wisdom and brilliance that are its domain are able to gain ground and reflect in the life and result of efforts of an individual.